With Fall finally here, some might want to tuck that bottle of tequila away in the back of the liquor cabinet – never to be seen, or heard from again until warmer months next year. Not in this house! Sure, I might make beer my beverage of choice for the winter months – but, a girl still needs a fruity mixed drink every now and again. My girlfriend visited Cape Cod over the summer, and came home raving about a pomegranate margarita she’d had on vacation, and begged me to come up with a recipe for her. So, here it is Michelle – only 3 months after you asked me! I love the addition of the pomegranate juice. It adds such beautiful color, and flavor, and enough sweetness that no simple syrup or agave is necessary. When I start to see those bright, fuchsia balls of color in the produce departments around this time of year – I can’t help but get excited for the months ahead. Fall and Halloween, Thanksgiving, and then – Christmas. It’s just so much fun, in the kitchen and otherwise, to look forward to. I’m hoping these festive and fruity drinks make the weeks pass by a little faster, so that treasured time with friends and family will be here all the quicker! Have a great weekend, everyone. 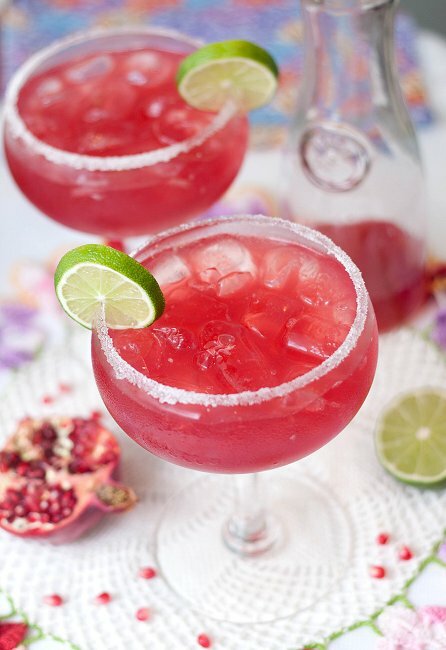 Prepare two margarita glasses by covering the rim with salt or sugar, then filling with ice. Set aside. Combine tequila, orange liquer, pomegranate juice, margarita mix, and a few cubes of ice in a cocktail shaker. Shake to combine. Strain margarita into prepared glasses. Garnish with slice of lime, if desired. Orange liqueur and pomegranates for this margarita recipe? I have oranges and pomegranates, thanks!